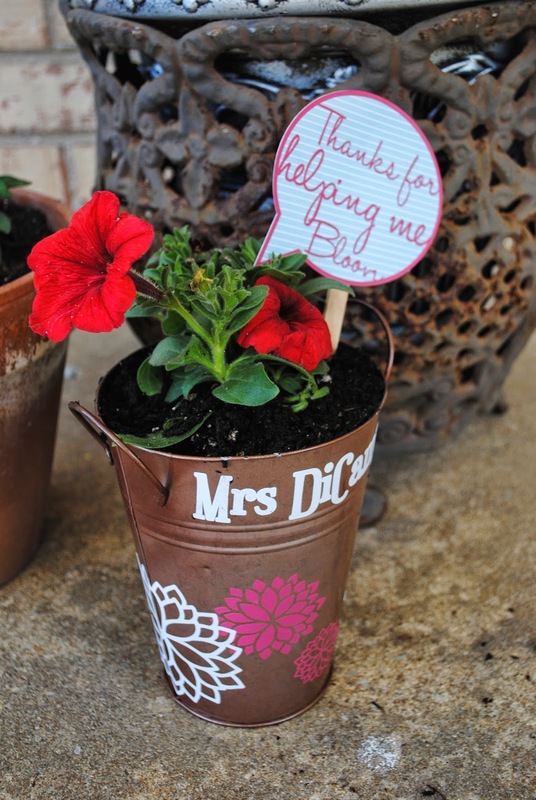 A few weeks ago I shared some cute little watering can flower pots as teacher gifts for Teacher Appreciation Week. 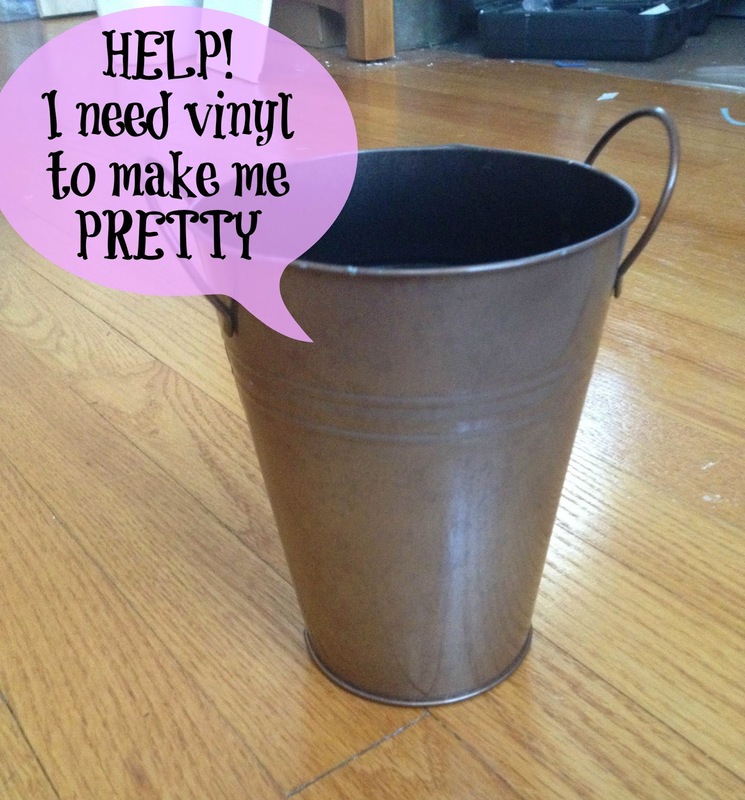 Today I wanted to share a similar project, but instead of cutting text on vinyl, I cut flowers on vinyl and used both the negative and positive cuts to decorate the dollar store vase. Here she is...looking awfully plain jane and screaming for some vinyl. Oh, and did someone say 'giveaway'? OH.YES.I.DID! 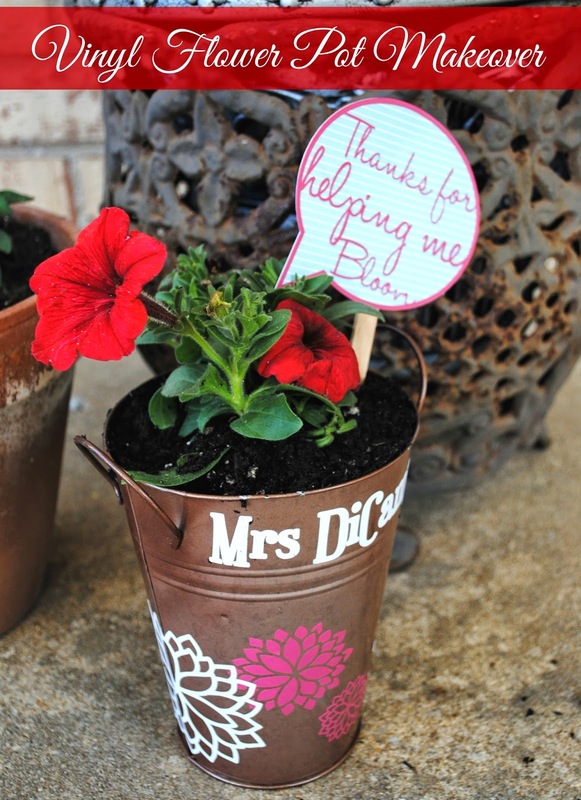 This DIY flower pot project is really versatile! It could be filled with real flowers or 3D paper flowers and can be given on so many occasions...birthdays, get well soon, baby gift, thinking of you, congratulations, end of the year teacher gift. I decided it would make a perfect end of the year teacher gift for my daughter's kindergarten teacher. I traced the flower design in Studio and then made a few duplicated it a few times so I could cut it in a few different sizes. I started by cutting out the white flowers and the teacher's name on the vinyl sheet. I used a cutting mat, although you don't have to with vinyl. 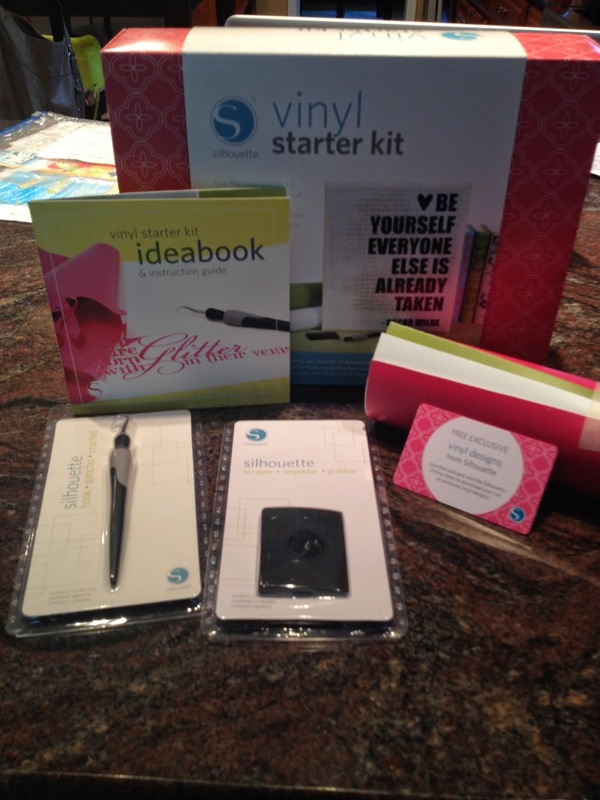 The vinyl starter kit comes with sheets of white, black, pink, and green vinyl which was great for this spring project. After the flower was cut I weeded it. Now, on most projects I feel like I end up wasting some of the vinyl because I only use on half of the cut. But for this flower pot, I decided to use both the negative and positive parts of the image. 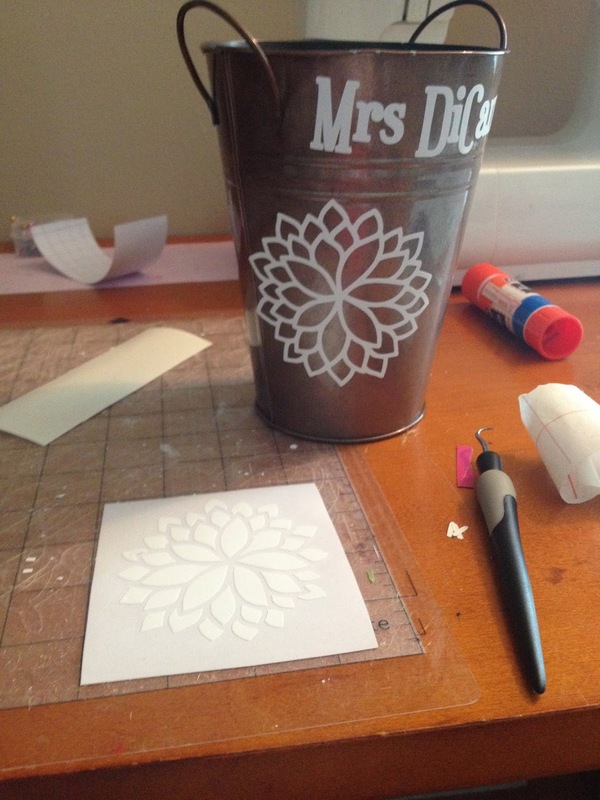 I started by carefully removing the outline of the flower without using any transfer tape. Some of the petals wanted to get stuck in the vinyl flower outline, so I used the hook to hold them down and in place while I kept peeling away the outline. 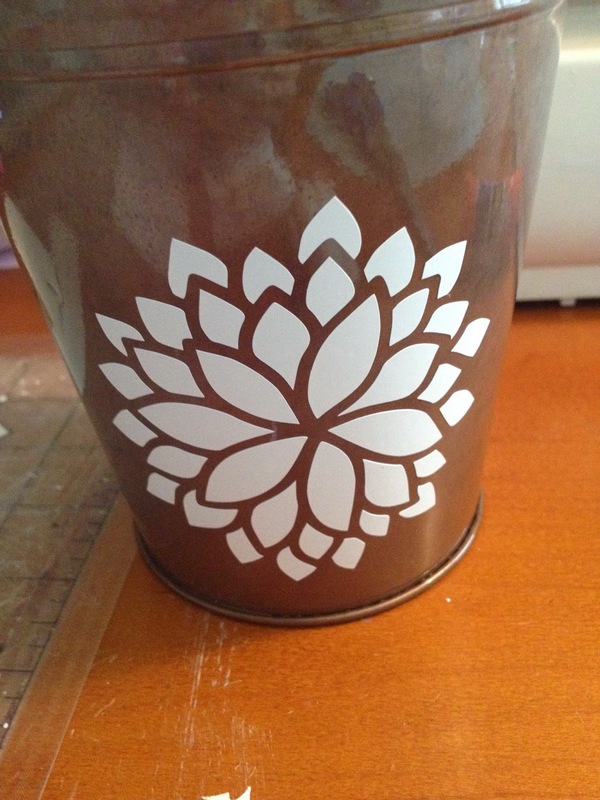 I positioned the outline on the flower pot and pressed it down firmly. Now to transfer all those petals perfectly onto the flower pot, I obviously had to use transfer tape. A big sheet of it comes in the starter kit so I cut off a small piece that would cover the entire flower. Peel off the backing and work with just the sticky gridded area. I pressed the sticky side down onto the vinyl flower, used the scraper from the kit to rub on top of the transfer tape to get all the vinyl stuck on there and then peeled the tape back up so I could move it onto my pot. Now I'm ready to position the flower onto the pot and again use the scraper to rub all the petals down onto the flower pot. Perfecto! I repeated this process again cutting different size flowers on the pink vinyl. The speech bubble card is one of the free shapes that comes with the Silhouette Software. I brought into a work area, typed in my message, welded it to the sides (not necessary) and then cut it out on the pink vinyl, as well. I then cut the exact same shape and size on the blue paper and transferred the pink vinyl speech bubble directly on top of the blue cardstock bubble. I taped the card to a popsicle stick and after I filled the pot with a little dirt and a pretty flower, I stuck the stick right in the dirt! I think the Silhouette Starter Kits are a great way to try out new products while you're still experimenting with your machine. Even if you have lots of experience, if you can grab the kits on sale, with all that's included - a download card in each plus all the supplies needed to complete a project - it's well worth it! Your classes are fantastic. I am getting braver with each cut. Question, where do I sign up for the giveaway? I would love to continue experimenting with different kits. Thank you.